Shoppers in northern Kentucky who need groceries – even things like fresh vegetables or hamburger meat – can now find them in a new, unlikely place: their neighborhood Walgreens store. With help from Sevan Multi-Site Solutions, Walgreens and Kroger recently launched a pilot program to co-brand a dozen Walgreens stores in Kentucky with a Kroger Express. The first of these grocery store-within-a-drug store models debuted in December 2018 at the Walgreens in Florence, Kentucky, a town near Kroger’s headquarters in Cincinnati, Ohio. Eleven more co-branded stores are planned in the area and should be operational in March, said Nathan Gray, Sevan’s Senior Project Manager. While it’s still too early to measure the success of this new program, Gray said initial reports show positive results – something that’s beneficial to both companies. 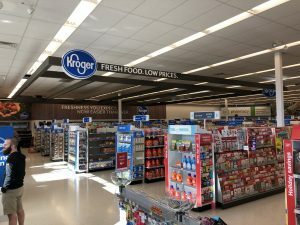 Sevan’s role in the project, which began in October 2018, has been to coordinate and manage the execution of the Kroger Express setup in the Walgreens space. That includes finalizing the intended look, like new Kroger Express signs that will be added to Walgreens’ exterior signs. Sevan also managed vendors for the project. The concept behind this co-branding idea is to create more traffic in Walgreens stores, for Kroger to advertise and sell its products in a new place and for consumers to get what they crave from retailers: convenience. 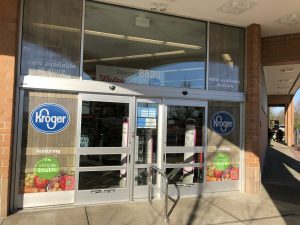 With Kroger Express bringing 2,300 products inside the Walgreens store, customers can easily pop into the corner drugstore and quickly get groceries they need without having to venture out to a giant grocery store. Customers also can pick up online Kroger grocery orders at these locations. They pull into a designated spot in the parking lot, call a number and someone brings their order out to the car. The offerings include fresh produce, dairy, meats, frozen foods, Home Chef meal kits, products from Kroger’s Our Brands line, and their Simple Truth natural and organic products. 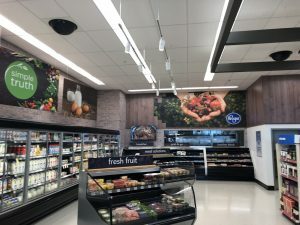 “It really feels like a mini Kroger when you walk in,” said Bradd Weddell, Sevan’s Operations Director of the Walgreens account. The Kroger Express areas are about 3,000-4,000 square feet, or roughly one-third of the Walgreens store, Weddell said. Each Kroger Express will have a similar layout, varying slightly depending on the number of coolers available. The management teams from Walgreens, Kroger and Sevan are all excited about the project’s potential. With brick-and-mortar stores facing steep competition from online delivery services, this can help drive traffic into the store and increase sales for both companies. “With the evolution of retail, it’s fun to be on the forefront of what’s happening out there,” Weddell said. Walgreens has done experiments like this in the past, with standalone healthcare services in their stores, like urgent care, hearing and optical offices.